Summary: Robie, 16, lives with her family on the Midway atoll, a group of islands in the middle of the Pacific. Her parents are scientists; it’s an isolated life. Robie enjoys visiting her aunt in Hawaii – she gets back and forth on a cargo plane that brings supplies to Midway. During a visit, her aunt is called to the mainland for a work emergency, leaving Robie to get home on her own. On her flight back to Midway the cargo plane hits nasty weather, and goes down. It’s just Robie, the pilot, and Max, a co-pilot she’s never met till this flight, on board. Robie is pulled aboard a raft by Max, who is injured and slipping in and out of consciousness. They have a bag of candy and very little water between them. When they finally reach an island that seems abandoned, Robie hopes they’ll be found quickly. But she’s not sure she was even on the flight manifest. Her parents must be looking for her…aren’t they? 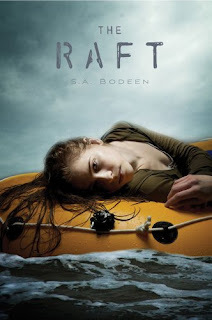 In THE RAFT, S.A. Bodeen creates a hair-raising suspense story that will have readers agonizing over the same question as Robie -- how long can they survive? My Thoughts: This isn't a bad novel, its just not my kind of novel that I would usually read. I'm more into young adult romance or paranormal novels. I don't read many about survival. The Raft starts off with Robie visiting her aunt. Robie is only 15 years old. Her aunt gets called away so Robie is left alone for a few days. She gets bored and decides to go on home so she books a flight and starts on her journey home. She doesn't make it very far because the plan goes down and she's thrown out the window on a raft by Co-pilot Max. Max also gets out and spends most of the novel in a dream like state. He does wake up a few times but mostly this novel is about Robie surviving on her own and coping with what that entails. The raft leaks, she's starving, she's cold, she's dehydrated. Does Robie and Max get saved? How does this one end? Read the book to find out. Overall: This was just ok for me. Like I said, not something I would normally give a chance so to get 3 cupcakes out of me was decent. It might even rate up there with a 3.5 rating. If you like books based on survival or based solely out on the water, you'll probably like this one a lot more than me. It was an ok novel, just not one of my favorites of the year. I did read the whole thing and it kept my attention enough, just won't go on my favorite shelf. I’m anxious to see other’s reviews on this one, as I’m sure some will adore it! Cover: Like it. Represents the book accurately since most of the novel is spent on a raft. I always like trying something a little different, so The Raft sounds like it might be worth a try. oh.. i hoped you liked this book more because i know my sister LOVED it! Great review though.. i can see why you didnt like it more! It's too bad you didn't like this one I really enjoyed it! But then again I love survival books!